Over the past five years, we've seen our community grow by leaps and bounds, and we've grown right alongside it. More and more of our users are managing complex workloads that require more resilience and need to be highly available. Our Floating IPs already enable you to implement an architecture that eliminates single points of failure, but we knew we could do better by bringing our "DO-Simple" approach to the problem. 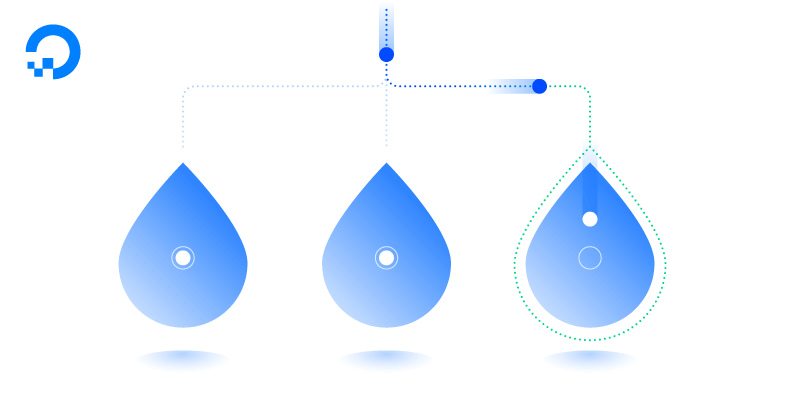 So today, we are releasing Load Balancers—a fully managed, highly available service that you can deploy as easily as a Droplet. Our goal is to provide simple and intuitive tools that let your team launch, scale, and manage production applications of any size. With our Load Balancers, just choose a region and which Droplets will receive the traffic. We take care of the rest. Load Balancers cost $10/month [note: edited November 5, 2018, from $20/month] with no additional bandwidth charges and are available in all DigitalOcean regions. Load balance TCP, HTTP, and HTTPS workloads within a specific DigitalOcean region. When using HTTPS, you can either terminate SSL on our Load Balancer or choose to use a passthrough mode. Choose your balancing algorithm and configure custom health checks, or use our defaults. Track Load Balancer usage and troubleshoot problems using the integrated graphs and metrics. Manage your Load Balancers using our web dashboard or APIs. For more details, see this overview on our Community site. 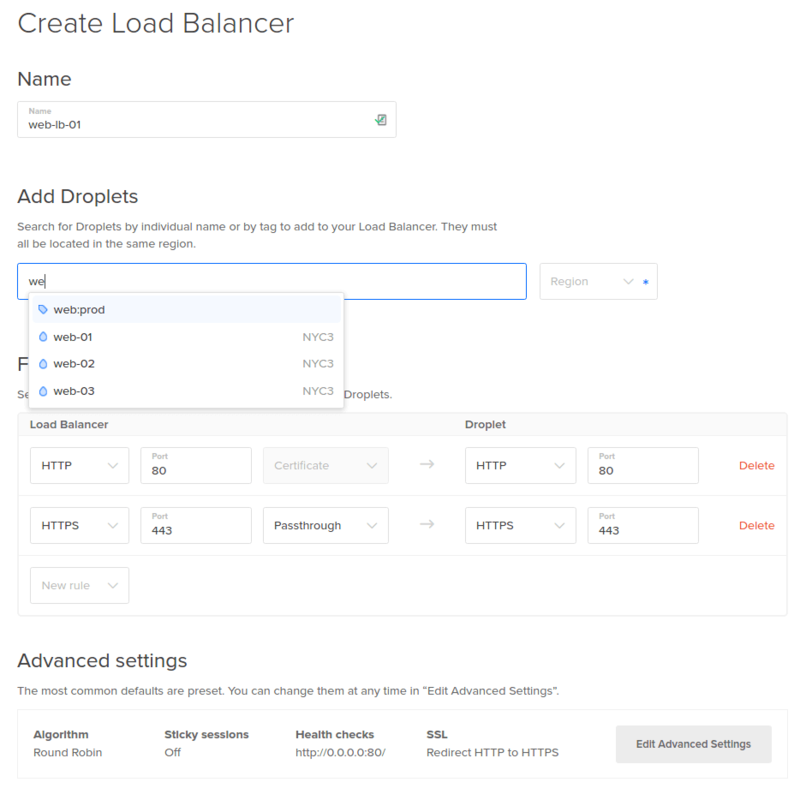 Your Load Balancer will distribute incoming traffic across your Droplets, allowing you to build more reliable and performant applications by creating redundancy. You can add target Droplets to a Load Balancer by either choosing specific Droplets, or choosing a tag used by a group of Droplets. With tags, scaling your application horizontally becomes easy. Launch a new Droplet with the tag applied, and it will be automatically added to your Load Balancer's backend pool, ready to receive traffic. Remove the tag, and the Droplet will be removed from the backend pool. Get started by following this step-by-step guide on our Community site. HTTPS configuration that gives you Grade A security out of the box. Uploaded SSL certificates are placed in a fully encrypted, isolated, and secure storage system. Load Balancer logs aren't stored anywhere on our systems (only metrics for troubleshooting). Provisioning and operation of our Load Balancers is fully automated; there's no human interaction. Learn more about configuring either SSL termination or SSL passthrough with our Community tutorials. Support for Load Balancers in our Ruby and Go libraries as well as our command-line client, doctl. Integration with Let's Encrypt for provisioning and deploying free TLS certificates with ease. Alerting on Load Balancer metrics with our upcoming Monitoring solution. Improved integration with DNS records managed by DigitalOcean. Improved controls for rolling deployments. Load Balancers that work across nearby datacenters. Load Balancers are just the beginning. Our 2017 roadmap is focused on bringing the "DO-Simple" experience to more complex, production workloads. Your feedback will help us as we improve Load Balancers and roll out more features, including new storage, security, and networking capabilities. Let us know what you think in the comments!